Bridging Disciplines. Supporting Scholarship. Connecting the Public. Join a vibrant and growing international community of scholars and enthusiasts by becoming a member of the ICS. "The International Catacomb Society (is) an organization that has done such important work over the years. Honored to be associated with it." Individual and Student Members ($50 & $30) receive advance copy of the Annual Report and all other publications of the ICS, access to password-protected, members-only features on the ICS web site, including our online image database DAPICS, eligibility (with Individual Membership) to apply for Shohet Scholars funding if all other criteria are met, and personal invitations to and networking opportunities at all ICS programs and events. Institutional Members ($500) are granted all the privileges of individual members for their staff. Click here to learn more about partnering with the ICS to take full advantage of its academic resources and funding opportunities for students and scholars. Friends ($500 +), Patrons ($1,000+), and Benefactors ($10,000+) of the International Catacomb Society will be listed in our Annual Report in the gift categories, unless a donor prefers to remain anonymous. It is also possible to make a gift in honor of or in memory of another person. More information about the ICS and our fund-raising goals is here. Please inquire about 2018 ICS membership rates and categories at membership@catacombsociety.org. Clicking on the "PayPal" logo above will bring you to a PayPal "push" page with the title "International Catacomb Society". In the blue-shaded area at top, please enter your donation amount (i.e. member fee). Email account: ahirschfeld@catacombsociety.org (please use this account for Paypal transactions). ICS membership dues (classified as a "donation" in our payment plan to qualify as a tax deduction under U.S. federal law) can be paid using the secure electronic payment system PayPal by either creating a PayPal account or continuing as a guest and entering your credit card or bank account information manually (limited to USA accounts). ** PayPal will email you a receipt; you can also print a receipt from the confirmation page. Additional information about the PayPal payment process are on www.paypal.com. ** To pay by credit card (without logging into a personal PayPal account), scroll down to the bottom of the page to where it says "Don't have a PayPal account?". Hit "continue" to reach the page "Pay with Credit Card or Log In" (link). Here you must enter your credit card information and all other required fields and then press "Review Donation and Continue" to complete electronic payment of ICS member fees. Membership application will not be considered complete and processed until annual dues are paid (step 2). Please allow several business days for processing a payment by check. Membership dues are annual and non-refundable. 2. 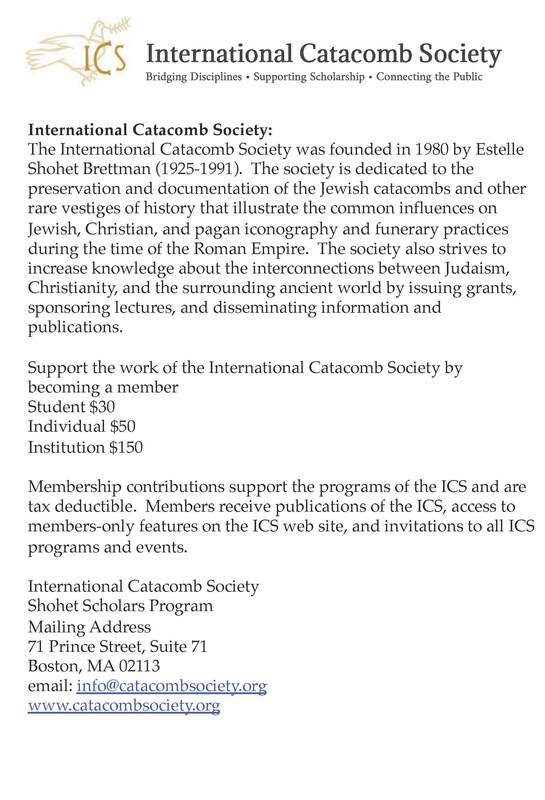 Email membership@catacombsociety.org to introduce yourself to the ICS (this way, we can track your registration and payment and confirm your membership). Once ICS receives the official notice of payment, it can provide you with your login name to access members-only website features. Membership dues and charitable contributions to the ICS Annual Fund in any amount support the programs of the ICS and are tax-deductible under IRS Code Section 170 (c) (2) and subsequent similar provision. Our fiscal year commences on July 1st of every year. If your company will match your gift, please enclose your company’s form. The International Catacomb Society is a 501(c)(3) organization, listed in the IRS Cumulative List of Organizations as “International Catacomb Society, Inc.” (#04-2693671). The growth of activities of the ICS is supported through its members and their continuing commitment. Through the generosity of individuals, trusts, foundations, institutions, and corporations, the ICS is able to accomplish its goals which provide valuable scientific and educational resources for the public.